Classrooms nationwide on Tuesday will celebrate Teacher Appreciation Day. While teachers do important — and often thankless — work every day, this day is set aside to honor the nation’s estimated 3.6 million teachers for their endless contributions to schools and communities around the country. In ways both profound and silly, students and their communities have been sharing the love for their teachers. From students buying their teacher a new puppy to parents doling out personalized bottles of wine, here’s a roundup of 18 of our favorite moments of the past year. 1. Whittling down the bucket list: Texas students help sick teacher raise money to see the redwoods — and splash in the Pacific — before it’s too late. Michelle Wistrand, a middle school English teacher, was dying of terminal cancer. But she had a bucket list, including a desire to see the Redwood Forest and swim in the Pacific Ocean. Eager to help a teacher they loved, her Texas students raised more than $10,000 on GoFundMe for her trip. Wistrand was able to visit several bucket list destinations before she died last month. 2. ‘We are going to carry you’: Ohio students promise to save their wheelchair-bound teacher in the event of a school shooting. The deadly Valentine’s Day massacre in Parkland, Florida, sparked difficult conversations among teachers and students around the country. What would they do if a shooter came into their classrooms? But for Marissa Schimmoeller, a high school English teacher in Ohio, there was an added level of anxiety: She uses a wheelchair. When her students asked what they should do if a shooting breaks out at school, Schimmoeller explained that their safety is her main concern; if they have a chance to escape, they should take it, she said — even if she doesn’t make it. 3. ‘We knew she loved us’: Fifty years later, Nashville students throw a party for their favorite teacher. There are some teachers you never forget, no matter how long you’ve been out of school. Marie Wiggins, 96, of Nashville, is one. The students she taught in the 1960s remembered that Wiggins had been there for them in difficult times, had helped them put on plays, respected them, and loved them — without putting up with their nonsense. Recently reconnected on Facebook, they organized a reunion to honor her. If you ask Michelle Obama, teachers basically run the world. 5. Two astronauts are bringing the ‘lost’ lessons of fallen teacher and Challenger astronaut Christa McAuliffe to life. Christa McAuliffe, tapped to become the first teacher in space, died when the space shuttle Challenger exploded in 1986. Her lesson plans — which would have been filmed in space for students on Earth — faded into oblivion. But in January, the Challenger Center, an educational nonprofit created after the disaster, announced that astronauts Joe Acaba and Ricky Arnold, both former educators, would use McAuliffe’s writings and notes to bring four of her six “lost lessons” to life. The pair planned to record the lessons on the International Space Station over several months, with video postings on the Challenger Center website slated for spring. McAuliffe’s lesson plans delve into topics such as liquids and Newton’s laws of motion. 6. Maybe their son didn’t drive his teachers to drink, but these Ohio parents knew he wasn’t the best-behaved. So they gave his teachers the perfect gift: personalized bottles of wine. For Christmas last year, the parents of Ohio eighth-grader Jake Sommers wanted to give his teachers something more than a stereotypical coffee mug. Since Jake has been a bit of a “school clown” since kindergarten — as his mother Mary Sommers affectionately told BuzzFeed News — alcohol seemed appropriate. 7. Chance the Rapper has given millions to Chicago schools. Now he’s heading a teachers awards show in June. Chicago teachers will be getting the all-star treatment this June, with rap icon and Chicago native Chance the Rapper spearheading a new awards ceremony to recognize “teachers, parents, principals, and students that convey leadership” in area schools. The annual “Twilight Awards” show, first announced in September, will feature special guest performances. CBS late-night personality James Corden will host. 8. Indiana teacher receives the gift of color — with a Harry Potter–themed twist. When Beau Scott’s Indiana students made him dress like he was getting ready for a Quidditch match out of the Harry Potter books, he had no idea they had something truly magical in store. Scott’s students knew he was colorblind, so they pitched in $5 to $10 each for a $300 pair of special glasses to allow him to see colors. 9. This Is Us star Sterling K. Brown gives thanks to his high school advisor — ‘the first adult who spoke to me about life’ — at TIME 100 gala. Sterling K. Brown has made a name for himself, starring in the NBC drama This Is Us and nabbing a historic Emmy win in 2017. But at the TIME 100 gala in April, Brown took a moment to honor his high school adviser and middle school algebra teacher. Barbara Jenkins Bull taught him the ins and outs of the stock market. She’d encouraged him to explore other countries. She cheered him on at every football and basketball game. 10. Students wanted to honor a Harvard educator who loves Sesame Street. So they transformed him into a muppet. A few students in Harvard’s Graduate School of Education wanted to thank professor Joe Blatt last June for bolstering the school’s relationship with Sesame Workshop, a Sesame Street–based nonprofit that supports children’s educational development. Nothing seemed more fitting than a look-alike muppet. 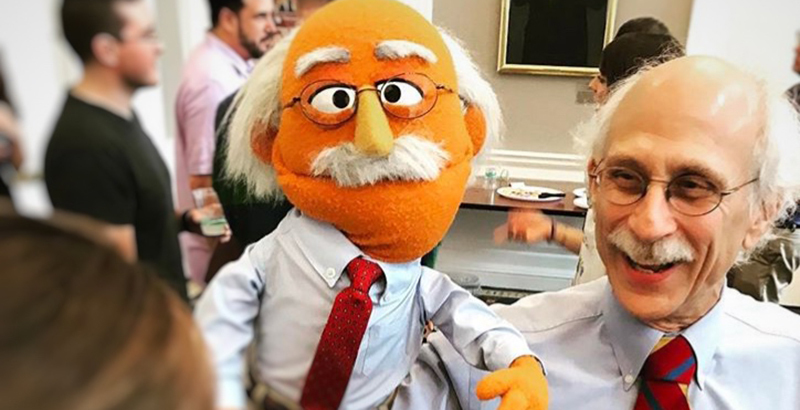 So they reached out to Sesame Workshop CEO Jeffrey Dunn and commissioned the professorial miniature — complete with a balding head, fluffy white mustache, rimmed glasses, and red tie. The Joe Blatt Muppet unveiling! 11. Puppy love: Alabama teacher’s class buys him a dog after he loses his. Troy Rogers, a high school teacher in Athens, Alabama, told his students in December that his dog of 11 years had run away, probably to die. After hearing the news, his senior class pooled their money and surprised him with a new puppy because they knew how much their teacher missed his old dog. Rogers named the puppy Clementine. 12. ‘This is everything’: Utah teacher breaks down when a former student shows up at her door after four decades. Utah teacher Margaret Foote had an unanticipated visitor last May: a former student from four decades prior, bearing a bouquet of red roses and a tiered, personalized cake. In 1978, Foote was a pillar of support for Cindy Davis, a Salt Lake City third-grader struggling with her mother’s remarriage, a recent move, and a lack of friends. Davis is now an educator herself. 13. Rhode Island teacher’s dream comes true when high schoolers create prosthetic arm for her son. All Rhode Island middle school math teacher Nicole Mancini wanted was for her 9-year-old adopted son, Olly — born without a lower left arm — to have a semblance of normalcy and independence. Last December, a group of Scituate High School students gave him just that, manufacturing a plastic prosthetic arm with a 3-D printer. The arm is green and purple, Olly’s favorite colors. In a Providence Journal video, Olly, sporting a huge grin, curled his new fingers a few times and leaned over to give his mom a hug. 14. New Mexico students surprise their teacher with a Christmas gift for his sick son. 15. Avengers’ Chris Hemsworth asks Twitter to support ‘the real superheroes’ — teachers like his mom. Avengers franchise star Chris Hemsworth, a.k.a. Thor, whose mom was a teacher, took to Twitter on April 30 to promote a partnership between Marvel Studios’ Avengers: Infinity War and Ziploc, which has pledged $100,000 in funding for classroom projects. Those who purchase Ziploc’s superhero-themed bags and containers that celebrate the film’s release will help support the donation, part of Ziploc’s #MoreThanATeacher initiative. 16. Fairbanks, Alaska, Girl Scouts give their highest honor to a retired — and beloved — Fairbanks teacher and Girl Scout leader. Despite her credentials, [Pierson] is a humble volunteer, willing to do what needs to be done, whether it is moving a Coke machine, fixing a bulletin board, selling tickets for charity or cleaning up after a charity event. 17. A sweet gesture: Huntsville, Alabama, student gives her ice cream money to teacher to help pay for father-in-law’s funeral. Price Lawrence was teaching his sixth-grade students one morning when they noticed something was off. He explained that he was worried about his wife because her father had recently died. When class ended, one student slipped a piece of paper and some coins in Lawrence’s hand. The note said “I’m sorry.” The coins were the student’s ice cream money for that day. 18. Students throw surprise party for Iowa teacher who’s been in the same district for 50 years. David Houseman has been teaching in southern Iowa’s Moulton-Udell School District for 50 years, and he still hasn’t updated his chalkboard to a SmartBoard. His former students, some of them teachers themselves now, recently reunited for a party to celebrate his half-century in the classroom. Houseman, who has no plans to retire, said his students keep him coming back. Best. Teacher. Ever. So glad I went to this!